Providers of finescale model railway kits, motors and related components. Now available in both 4mm/ft. scale and 7mm/ft. scales, our first new kit for 2018 is now available to order online here . This is for a Taff Vale Railway iron goods wagon/iron mink of the type drawn on page 42 of Lewis, J. H. et al, All about GWR Iron Minks. Historical Model Railway Society, 1980. Development of the GWR/BR Diagram DD3 3108 gallon tank wagon is now well underway and we hope to be able to show a test build soon. Link courtesy of Nick Baxter/GWR 813 Preservation Fund. We plan to have to have the Cambrian Railways "Albion" class 2-4-0 ready for Q1 2019. Taff Vale Railway 6" wagon lettering is now available at £4-50 a set+ £1.00 postage. 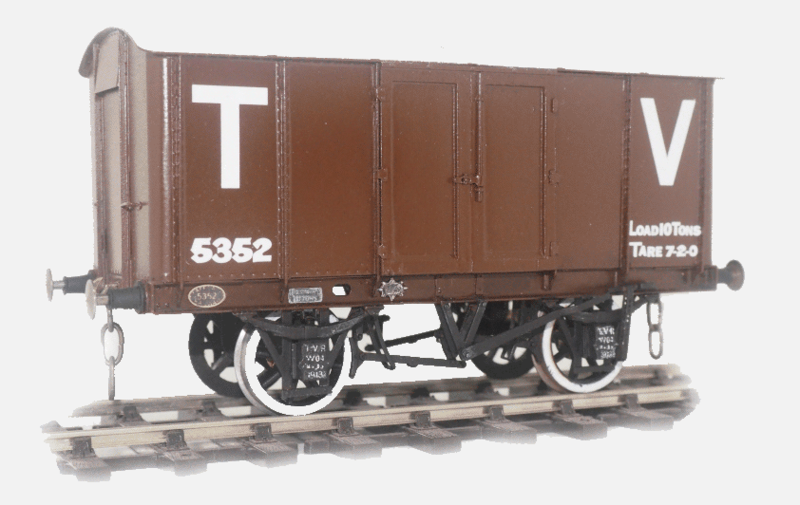 The sheets contain standard lettering together with small lettering for machinery wagons and bolsters. Lost wax brass stanchions are available as an upgrade to Macaw or other bolster wagons provided with white metal or wire components. These are available on our eBay site and will soon be available via this website. Our 7mm kit of a Greenwood & Batley 4 wheel battery electric lococmotive is now in stock. A number of these locomotives were used in industry and with their 6'10" wheelbase, they are ideal for the smallest layouts. Kits will be available either as a complete package including, gears and motor or as a set of etches and castings. New 1833 motor with same dimensions, mounting screws intended as a drop in Mashima 1833 replcement. Dragon Models: Locomotives and Welsh railway rolling stock, mainly 7mm/ft. scale, some 4mm/ft. too. Celtic Connection: A range of fascinating non-Welsh prototypes from the rest of the UK in 7mm/ft. scale. Taff Vale Models: 12volt DC 5 pole skew wound motors available on our online motor shop or alternatively our eBay page, together with etched gearboxes and other components. Any new kits will also fall under this brand inluding the recently introduced Taff Vale Railway Iron Mink. Some of our products can be purchased using PayPal on the online shopping links on the menu at the top of the page. All other items in stock can be ordered via telephone, e-mail or letter using our contact details here. A number of products are usually listed our eBay page. This will also give you an idea of the customer feedback on our products and service. We can accept payment with cash (in person), cheque and all major cards however we request you don't send card payment details in the post or email. We are available to take card payments over the phone and are happy to accept payments via PayPal invoice or direct bank transfer. We are working on an online shop however however this will take some time. We normally post at cost and use a signed-for service for more expensive items. Items can be shipped overseas at cost, however the purchaser will be responsible for settlement of import related tariffs, customs duty or related costs. Some of the less popular kits may not be in stock and therefore the required components will need to be ordered. If this is the case, you will be advised of the likely timescale.